Apologies for the many months of blog post silence – not much excuse really, other than that the room I keep my stuff and the computer in is cold in winter and spring, so I’ve been hibernating. Now that summer is here the posts should flow. Anyway, on to the topic at hand. Over the last few years I’ve become less interested in clutter and more interested in space and simplicity. This is not at all reflected in my vintage textiles collection (or in my life either!). Most of my stuff is highly decorated and brightly colored. I decided to go through it and pull out some items which could be classed as simple. I didn’t find many, but here are some which fit this description. This is a cute but sadly stained crocheted sugar bowl cover. 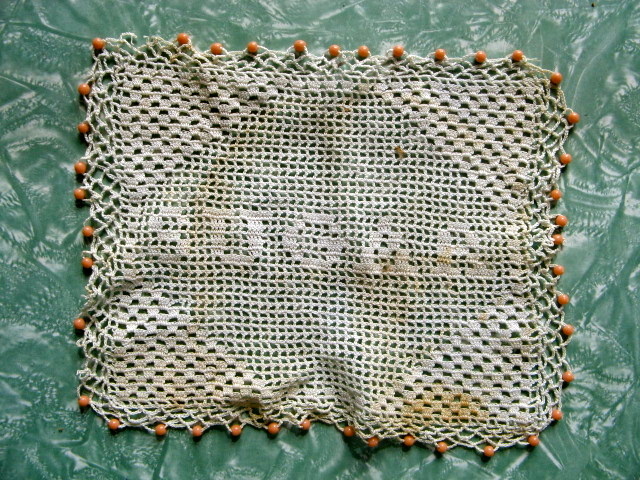 As you can see, the word ‘SUGAR’ is crocheted in the middle, leaving the user with no doubt as to its purpose. Its basic design and appearance is only subtly relieved by the small peachy beads around the edges. It’s made of good, sturdy cotton and would certainly still repel any unwanted flies from the sugar bowl. 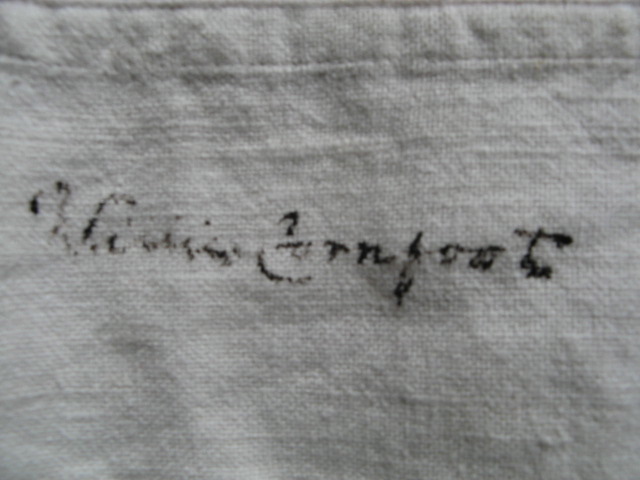 I bought this linen cloth recently – not sure what it is, as it’s an usual size. Perhaps it was made for a particular table. 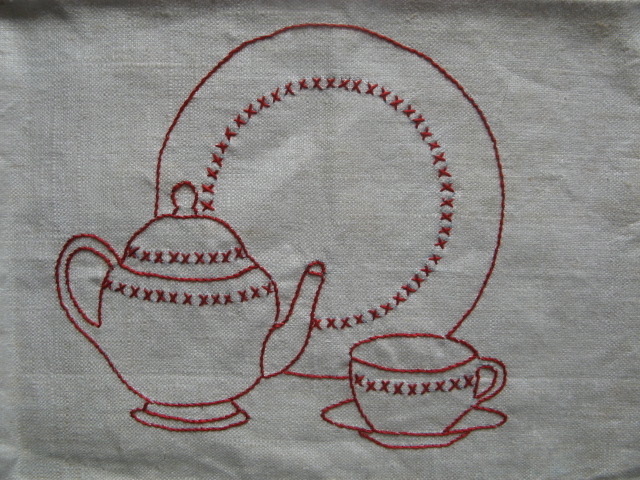 It’s clearly intended to accompany morning or afternoon tea, as the beautifully simple embroidery shows. It’s not the most expertly-embroidered piece – the lines are kinda wobbly and the pattern marks show in places. This doesn’t bother me, I think it’s really charming. The embroidery is in the bottom left corner, which I find nicely restrained. Red on linen is such a nice combination. The linen is really stiff and hard to iron, hence the ugly creases. I really dislike seeing creases in photographs of vintage textiles but this cloth requires far too long at the ironing board for my liking! Next is a detail from a very plain, work-a-day, thick, calico-like cotton apron I bought at an opshop in Marton (Rangitikei region). It’s a full wide apron but with a narrow bib and very short attached string for the neck . I can barely get it over my head. It has a nice, big pocket on the front. It was probably intended for every-day wear but is in reasonable knick with few stains. What makes this simple apron interesting in the name written in ink on the bottom hem – Winnie (?) Cornfoot. A few second’s research on google tells me that a Mrs Agnes Cornfoot of Halcombe (near Fielding, which is not far from Marton) signed the famous New Zealand women’s suffrage petition, which was submitted to Parliament in 1893. I feel sure they must be related! It’s very handy when one’s historical subject has a distinctive surname. I’m not sure I’ve got the first name right, so please feel free to suggest alternatives to Winnie. My next simple item departs from white & cream, but is nonetheless very straightforward. 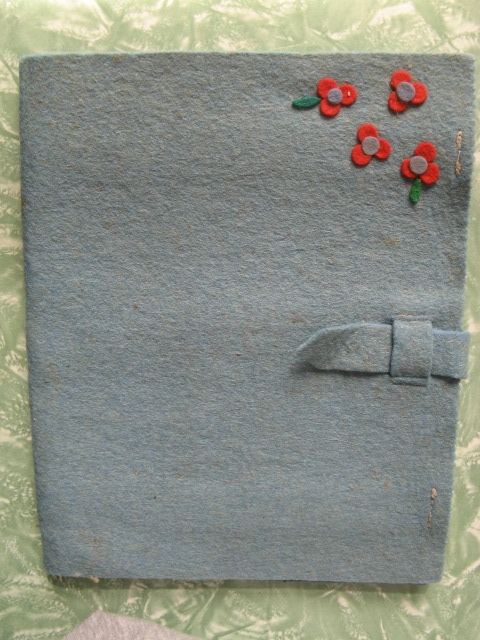 It’s a felt stationary case with simple felt flowers attached to the top right corner. On the inside is a large pocket for pens and things and two strips of felt at top and bottom to hold writing paper. The front left edge has been cut with pinking shears. I’m very fond of this and I was inspired to make my partner a sketchbook case similar to this out of a light woolen fabric and vintage satin for christmas. I bought this at a vintage linen fair in Upper Hutt a good few years ago. This annual event was a vintage lover’s dream (though there was always a mad, slightly unpleasant stampede when the doors opened) but I haven’t seen it advertised for the past two years, so maybe it’s not on anymore. The last piece is what I presume to be a cotton stationary or writing case. It’s a flimsy number – the writing paper is what would have given it some solidity. 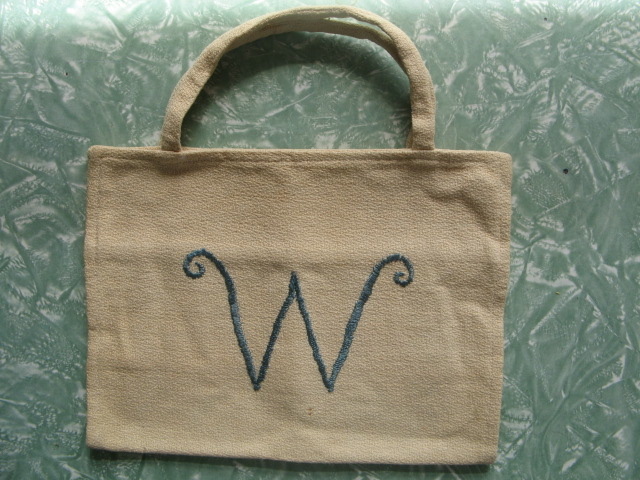 A big ‘W’ is embroidered on one side, and simple squares and stars on the back. Similar to the felt case, it has pockets and strips on the inside. It looks to me like something a child might have made. As much as I still love colorful embroidery and patterns, there’s something refreshing about these items. The makers didn’t feel the need to go to town with the decoration, maybe because they were amateur makers or perhaps because they liked simple things. ps – could the last item be a book bag? i made them for my kids, including genevieve, in primary school – they were for keeping your reading book hanging on your chair then taking it home to read to mum and dad. You could be right Ann – I did wonder whether the ‘W’ was for ‘writing’ or the maker’s initial. In fact, the inside looks like it would be more suitable for books. I particularly like the sugar bowl cover – such a lot of work for a simple object!